Starring: Anton Yelchin, Patrick Stewart, Imogen Poots, Macon Blair, Joe Cole, Alia Shawkat, Callum Turner, David W. Thompson, Mark Webber, Eric Edelstien, Michael Draper, Brent Werzner, Kai Lennox. After his little seen debut Murder Party in 2007, Jeremy Saulnier’s second film Blue Ruin took the film circuit by storm in 2013 and turned out to be one of the biggest surprises of the year. It was a taught and very well constructed low-budget thriller that reached many people’s list of favourites (myself included). As is always the case, though, it brought much anticipation for his third feature. And deservedly so. The pressure was always on but by sticking to a winning formula, Saulnier again delivers a film that has much to recommend it. Punk band, The Ain’t Rights, get a last minute booking in a Neo-Nazi club deep in the backwoods of Oregon. What seems like a standard gig soon turns into something very dangerous when they witness a murder backstage. 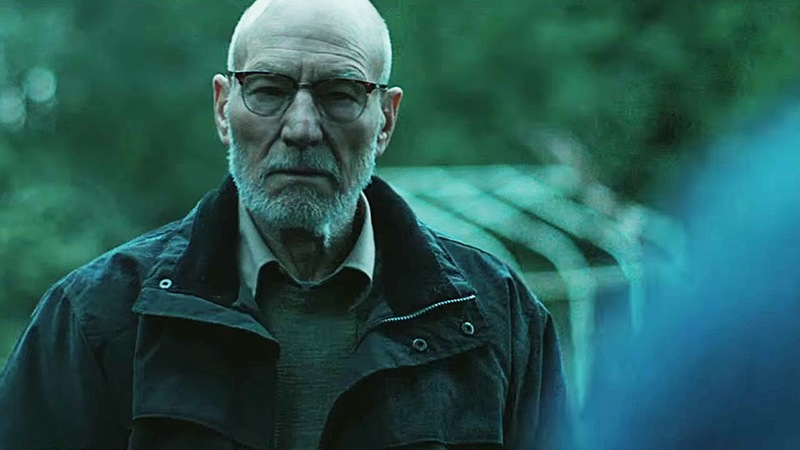 They take refuge in the Green Room, and finds themselves planning and negotiating with the club’s ruthless owner (Patrick Stewart) to ensure they walk out alive. As if there wasn’t enough attention surrounding what Saulnier would deliver next, this film also had some added publicity with leading actor Anton Yelchin – who died in a freak accident just after the film’s release. This adds a bittersweet feeling when watching him onscreen. 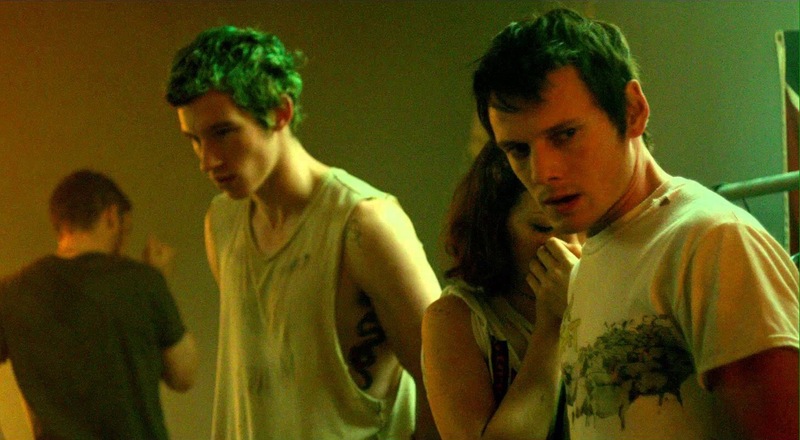 His death was sad news but Green Room is a wonderful reminder of his talents. What works best with Saulnier’s structure, though, is that no one really takes centre stage. This is a siege film that benefits from not knowing which character will perish next and with films of this type, that always adds an extra layer of tension. With the help of Sean Porter’s gritty cinematography, Saulnier seems to build tension with ease by using a similar authenticity that Blue Ruin benefited greatly from. His characters feel genuine and he draws out some great performances. Much has been said about Yelchin or an imposing, cast-against-type, Patrick Stewart but it’s Blue Ruin‘s leading man Macon Blair that shines most. Blair is given less screen time here but he’s afforded a character who’s motivations change throughout the film and his subtlety and three-dimensional approach to the role is very impressive indeed. However, as the film went on I found it harder to invest in. Plot holes gradually crept in and credulity wained in the final third with a relayed paintball experience becoming integral to a particular character’s motivations which I found tenuous and a desperate attempt to dig itself out a hole. Some may disagree and have less of a problem with this but it felt jarring an unsatisfactory to me. Normally, this wouldn’t be an issue had the film not set itself up so well but it’s solid premise and excellent early delivery almost draws attention to it’s flaws later on. I admire Saulnier’s chutzpah but, despite his flawless direction, his story eventually runs out of steam. 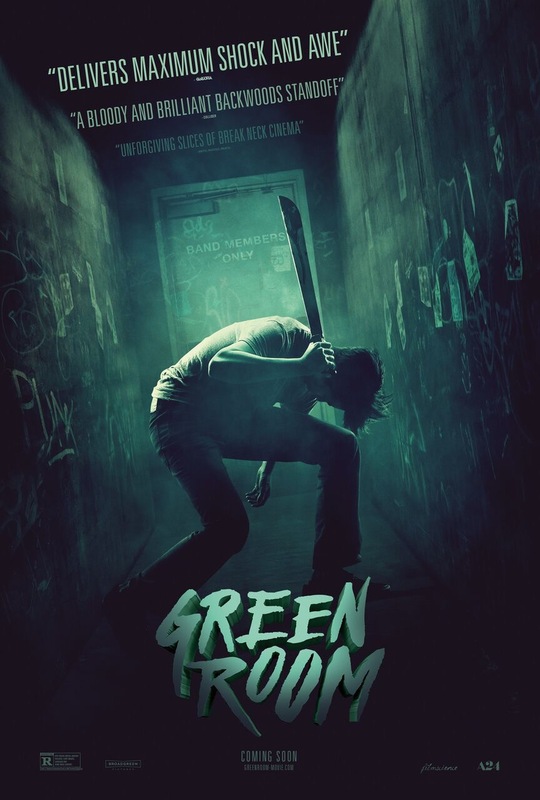 That aside, Green Room still has plenty to offer. It may sound like I’m criticising but I’m merely pointing out problems that prevented it from becoming as astute and tightly wound as Saulnier’s previous output. To be fair to him, though, that’s a very hard act to follow. Trivia: The stance of the machete wielder in the poster references The Clash’s “London Calling” album cover with bassist Paul Simonon smashing a guitar. This entry was posted on August 24, 2016 at 8:14 pm and is filed under Crime, thriller with tags 2016. You can follow any responses to this entry through the RSS 2.0 feed. You can leave a response, or trackback from your own site. He looks like the real deal, man. I had issues with how Green Room played out towards the end but it was, otherwise, very well delivered. Absolutely adore Blue Ruin, though. And Murder Party is on my watchlist too. I still haven’t seen this – I keep thinking ‘I need to catch up with it’ as I liked Blue Ruin a lot and this seems to have gotten lots of good reviews this year. Nice to see Macon Blair get a mention…I’d heard he was good in this and like you I thought he was pretty good in Blue Ruin too. I enjoyed it, man. Felt a little disappointed in the final third and the fact that it’s not as tight as Blue Ruin but Saulnier does okay, for the most part. Many may not even notice the work that Macon Blair does here as his role is quite small but he really stood out for me. It’s no instant cult classic or anything but it’s decent viewing. Good stuff – I’m looking forward to it. Wanted to catch it on the big screen but just didn’t get into London that month and it didn’t play anywhere near me. I’ve been tempted to rewatch Blue Ruin a few times as it’s on Netflix. Blue Ruin is revisit requirement of mine too. I’ve only seen it the once but I still vividly remember it like it was yesterday. I hope it holds up. I’m really looking forward to having the courage to watch this. It’s a decent flick, Jay. I might not praise it as highly as some others have but it was solid enough. Just brilliant movie. 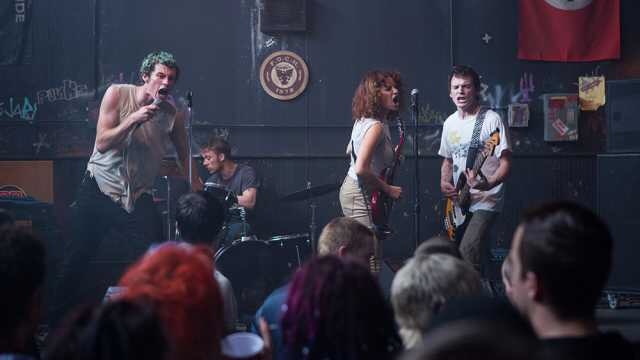 Saulnier gets better with every flick for me (Green Room edges Blue Ruin because I love the punk references – love that the scene hasn’t evolved since 80s! ), so is definitely now movie-maker whose next one is a calendar tick. I’m still partial to Blue Ruin over it but I’m with you on the punk vibe. Saulnier is definitely a filmmaker that I’ll be keeping a close eye on as well. Nice review Mark. I absolutely loved everything about the movie: the atmosphere, the direction, and the soundtrack. Blue Ruin was a great picture too but this was even better. Stewart is superb in his role and Yeltsin is just as good (it’s tragic that he died so young). I thought the story worked well with a strong pay-off but I do know a couple of others were disappointed by the conclusion. Cheers Man! I’m absolutely with you on the direction, the atmosphere and the soundtrack. The cinematography really stood out as well but it was the final third of the story that I had issues with. I felt like it didn’t really know how to wrap it up properly. That aside, I still really enjoyed it. Great write up Mark! I can agree with you that in the last bit it ran out of steam, but it was a pretty good watch. Not Blue Ruin though, let’s not even play. I love that piece of trivia! It wasn’t Blue Ruin quality for me either, Zoë. I still admired what Saulnier was doing though. It’s by no means a bad film, it just doesn’t live up to the standard of his previous film. Loved this movie. Good review! Thanks man. It was a good flick. Can’t wait to see what Saulnier goes for next. I enjoyed this more than yourself, although I appreciate your reservations. The ending kinda fails to live up to the promise of the first two acts, but it was saved for me by a raft of excellent turns, not least of which Stewart who knocks it out of the park. Yeah, I feel like I could be being overly critical on the final third but, as you say, it was so strong up until then that I felt it suffered a little. Some great performances, though, and Saulnier has a fine handle on things too. I’ll have to check out Blue Ruin. I enjoyed Green Room, talk about intense and those dogs are scary stuff! Fine review. Cheers Eddie. I highly recommend Blue Ruin. Such a tight little Coenesque thriller that deserved all the plaudits it received.